Can Fear Be Passed Down Through Generations Within DNA? If this mouse's parent learned to fear a certain smell, then it might have inherited this fear via the parent's DNA. Image courtesy of Wikimedia Commons. Imagine a world where your experiences can be passed on to the next generation. This almost certainly wouldn’t be like in the world of Frank Herbert’s Dune where ancestors’ memories can be completely recovered. Instead, your kids might react to a certain smell based on your experiences with it. Scientists don’t yet know if this happens in people, but they have now confirmed in a new study that this sort of thing does happen in mice. In this study, Dias and Ressler trained mice to react negatively to the orangey smelling chemical, acetophone and found that the mouse’s pups and grandpups reacted negatively to the same smell but not to a very similar chemical, propanol. The aversion to this specific smell had apparently been passed down the generations. This wasn’t something the pups learned from their parents either. The authors did the same sort of experiment but instead of leaving pups with parents trained to fear acetophone, they took them away immediately after birth and had mice who had never even smelled the chemical before raise them. When these adopted pups grew up, they still reacted negatively to acetophone. To show this wasn’t some special property of this particular chemical, the authors did a separate set of experiments where they trained mice to react negatively to the smell of the closely related chemical propanol. The pups and grandpups of these mice reacted negatively to propanol but not to acetophone. It definitely looks like these mice passed their aversion to certain chemicals down through the generations. 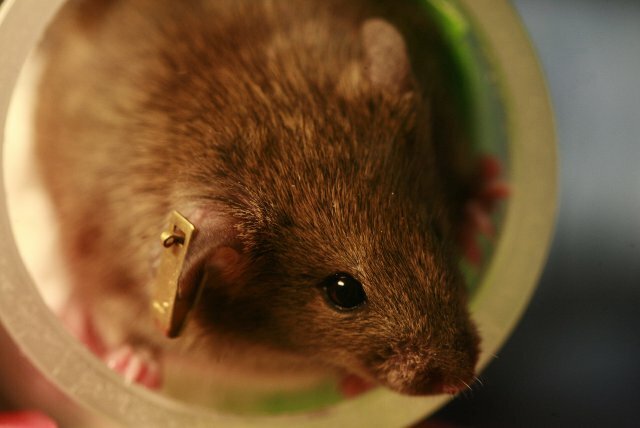 Mice learn to react to this smell through certain changes in a specific part of their brain. The pups and grandpups of mice trained to have a negative reaction to acetophone had these brain changes as well. To really nail down the fact that this change was inherited and not learned, Dias and Ressler did an in vitro fertilization (IVF) study. They fertilized mouse eggs with sperm from a mouse trained to associate the smell of acetophone with a negative experience and placed these fertilized eggs in a female mouse that had never smelled acetophone before. The resulting pups had the same brain changes associated with a fear of acetophone. And it wasn’t just their brains that were changed by the experience either—their DNA was changed as well. When the authors looked at the region of the genome containing the gene involved in detecting acetophone, they saw that it was altered in the mice that feared this chemical. This change was also seen in the mouse’s sperm, in the mouse’s pups and grandpups and in the DNA of the in vitro fertilized mice. The environment caused a change in the mouse’s DNA that was passed down. The changes they found weren’t in the fundamental genetic code. In other words, acetophone did not change an A, G, C, or T in this part of a mouse’s genome. Instead, the changes were of the epigenetic sort. Methyl groups like these can be added to our DNA and affect how our genes work. Image courtesy of Wikimedia Commons. 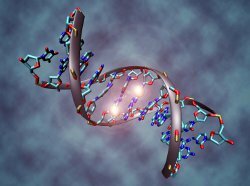 Epigenetics is the study of how the environment can impact how genes work. One of the most common ways for this to happen is through a chemical modification of the DNA called methylation. In general, the more methyl groups decorating a piece of DNA, the lower the level that nearby genes are turned on. The authors found that these mice and their equally fearful pups and grandpups all had less methylation over the part of their DNA involved in smelling acetophone. This most likely means that the genes in this area were turned on to a higher level which likely explains the associated changes in brain structure. So it looks like a fear of acetophone can be passed down to the next generation in mice and that part of the way it happens is through a change in the DNA that also gets passed down. As this is a first step, we don’t yet know how common this sort of thing is in mice or whether it happens at all in people. More experiments will need to be done (at least in mice). Methylation is also unlikely to be the whole story. Although the authors failed to find other epigenetic changes in the DNA of these mice, they were by no means exhaustive in their search. There may be other changes needed to pass memories from generation to generation. It is also important to note that this is not an interesting story because an epigenetic change was inherited from a parent. There are many examples of this in mice and even a few in people with the best one being survivors of the Dutch Hunger Winter. No, what makes this study so interesting is that a behavior based on an outside experience can be passed down because of changes to the DNA. It is obvious how something like this might be an advantage to a mouse. A pup would not have to be taught that a local smell belongs to a poisonous bush or some awful animal. Instead, its genome would have already been preloaded with the necessary software to avoid the danger. If people can pass down memories like this too, then this sort of thing might have been an advantage to our ancestors for the same reasons they would be for mice. Our ancestors could avoid potential dangers more easily. But this may not be as useful in the modern world. In fact, it could be a troubling way that fears and traumas are passed down through the generations. Before we worry too much though, we need to keep in mind that so far there is no evidence that memories like this can be passed down in people too. And besides, this sort of thing doesn’t have to be all doom and gloom. Maybe this is also a way for happy memories to pass down the generations. Finally, even if humans can pass down bad memories, at least now we know it is possible. Studies like the one here might even prove useful in helping scientists understand how it can happen and maybe even in finding ways to reverse the effects.